Why is Tracfone Rated My Best Prepaid Cell Plan? Rates---6.6 cents per minute always available. You can get minutes even cheaper if you check for and use Tracfone Bonus Codes. Roaming---Only Tracfone and Net10 allow you to roam from AT&T to T-Mobile without roaming fees. Most prepaid services will not roam or will charge you a lot per minute for roaming. Availability---Phone cards and the phones are available at Wal-mart, Safeway, Best Buy and just about every major retail chain in the US. 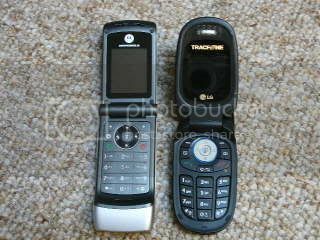 The Tracfone.com website usually has the largest selection of phones and unbeatable phone deals. Simplicity---Buy a Tracfone, activate it, add minutes and use. No credit check, no checking account or credit card required. Simply add a Tracfone card when you are low on either minutes or service time. Service Time cost---You can keep your Tracfone active for as little a $20 for three months. Most other prepaid phones require spending at least $15 per month. Deals---The best deals on Tracfones are at the Tracfone.com website. The deals where you get a DMFL Tracfone for free with the purchase of a minute card are unbeatable and the reason Tracfone is now my top pick. The reason they are on the top of my list is because Straight Talk offers Unlimited talk and unlimited text and picture messaging Nationwide for only $45 per month. Plans start as low as $30 a month. They are available everywhere that Verizon wireless has coverage. Straight Talk uses the Verizon Tower network. For more information check on the Straight Talk Unlimited Plan and the $30 Straight Talk All you Need Plan. T-Mobile Prepaid charges 10 cents per minute if you spend $100 (1,000 minutes) and you get 1 year of service. If you do not buy $100 in minutes all at once your minutes and activity time will cost you more. The reason T-Mobile is not my #1 rated is because you cannot roam with a T-mobile prepaid and so where the phone can be used is much more limited. T-Mobile has some of the nicest phones available for prepaid and if they have good coverage in your area they are a good choice. Net10 minutes cost 10 cents all the time. You must spend $15 a month to keep your Net10 phone active but if you are using more than 150 minutes a month all the time they are a good deal. If you are using a Net10 phone now it isn't worth it in my book to transfer to Tracfone because the plans cost about the same. Tracfone and Net10 are owned by the same company. has several features that could make it the best wireless plan for you. The 75 cents per day plan allows you to choose 2 of four options. This is an inexpensive plan with some very valuable options. If you make a lot of calls to One phone number, want unlimited texting, Unlimited calls to Alltel customers, or unlimited nights and weekends Check it out at Alltel U Prepaid Alltel has the Best prepaid cell phone with Unlimited Texting. plans because they offer plans with unlimited minutes to anyone or at least to their other customers. If all your friends are on Verizon, one of the Verizon plans is probably the best for you with unlimited In Network calling. If all your friends call you then the Boost Plan might work best. Boost offers free incoming calls. Many of the others can work. Look carefully at the Minimum cost per minute and the minimum cost per month. It is important where the phone is going to be used. Some wireless networks will not work well in your area. If the phone you get does not get good service take it back. Most of the plans have either 15 or 30 day return policies. They will not refund you for the minutes purchased. My Overview of all the Major Prepaid Cellular Plans. Availability---Most parts of the country. Minute Cost--20 Cents per minute daytime, 10 Cents per minute Nights and Weekends. Minimum Cost per Month--$6.67 You must add money to your account at least every 90 days. Notes--Boost is the only Prepaid service to also offer their Walkie-Talkie service $1.50 per day on Basic plan. Boost offers Wireless Web access for 20 cents per day. Access Cost --$49.95 per month. Minute Cost--200 Daytime Minutes Included 10 Cents on extra minutes Nights and Weekends. Notes--Includes Walkie-Talkie service, Wireless Web access, Free Text Messaging, Unlimited night and weekends. This is one of the Best Prepaid Cell phone plans if your friends are on Nextel. Availability--Only available in a few Markets in the US. Cost of phone--$129-$299--At times they have had a $100 rebate on their phones if you stay with their system for 3 months. Minute Cost--$0 Unlimited minutes for $30 per month. Minimum Cost per Month--$30 for unlimited minutes. Many extras are available like voice mail, text messaging, caller ID, for additional charges. Network Note--The Cricket phone is only available in limited areas. One of the Best Prepaid Cell plans for users of lots of minutes if available in your area. Minute Cost--10 Cents outgoing. All incoming calls are FREE. FREE Text messages. Minimum Cost per Month--$15 but all incoming calls are free!! Also Free Text Messaging.Network Note--The Cricket/Jump Moblie phone is only available in limited areas. One of the Best Prepaid Cell plans if available in your area if you use a lot of minutes. Availability--You can get a phone number in most parts of the US. Minute Cost--10 Cents & 60 Days $30, 10 Cents & 90 Days $60, 10 Cents & 180 Days $50, 10 Cents and 365 days $300. Minimum Cost per Month--$15 Buy the $30 card every 60 days and have 150 minutes per month to use. Access Note--If you add more than one card at a time your access is not extended. Wait until you are almost out of minutes or time and add the card then. One of the Best Prepaid Cell if available in your area if you use 150-400 minutes per month. Minimum Cost per Month--$8.33 If you buy 400 minutes/ $100 you will get 365 days of access. Minute Note--15 Cents & 60 Days $20, 15 Cents & 60 Days $30, 25 Cents & 60 Days $50, 15 Cents and 365 days $100. Phone Availability--four different phones from $36 to $67. They offer a nice folding Kyocera KX1 with dual displays for $66.92. Network Notes--Simple Freedom phones work on the Alltel network. Currently if you activate your phone online you will get $30.01 airtime balance. If you activate by landline you will only get $10.01 airtime balance. This is just an OK plan this is not one of the Best Prepaid Cell phone plans the minutes are too expensive. Currently this plan gets and honorable mention as one of the Best Prepaid Cell Plans available. Minute Cost-- 33 Cents & 30 Days $10, 19.2 Cents & 90 Days $25, 12.5 Cents & 90 Days $50, 10 Cents and 365 days $100. Minimum Cost per Month--$8.33 Buy the $100 card 83 minutes per month to use. Minute Note--Once you have spent $100 on refills in your account your per minute rates drop by at least 15% and your minutes do not expire for 1 full year. Phone Availability--T-Mobile has the Best Prepaid Cell Phones available for Prepaid including the Motorola Razr and the SidekickII. This is the Best Prepaid Cell if available in your area for 10-400 minutes use per month. Availability--You can get a phone number in every Zip Code in the US. Minute Cost--50 Cents & 60 Days $20, 30 Cents & 60 Days $30, 25 Cents & 60 Days $50, 20 Cents and 60 days $80. Buy the $89.95 One Year access card and get 150 minutes OR buy a $20 card every other month and get 20 minutes per month to use. Access Note--If you add several Minute cards at one time you will not go over 120 days of access. March '06--Tracfone is currently lowering their rates-- This is one of the Best Prepaid Cell phone plans if T-mobile or Net 10 are not available in your area. Availability--Available anywhere Sprint PCS network is available--Much of the USA. Minute Cost--25 Cents for the first 10 minutes per day then 10 Cents. Minimum Cost per Month--$5 if you automatically add money to your account at $15 every 90 Days. Minute Note--You must add $20 ($15 if you have it automatically done) to your account every 90 days even if you have minutes. Phone Availability--Some real nice phones are available and also some very inexpensive phones. Network--Virgin Mobile works on the Sprint PCS network. Access Cost--35 Cents per day. Network--Virgin Moblie works on the Sprint PCS network. Availability--Available anywhere Verizon network is available--Much of the USACost of phone--$70 to $120 + $35 Activation fee. Minute Cost--350 anytime minutes included, additional minutes 14 cents and unlimited IN calling (free calling to all Verizon customers) and free night minutes. Availability--Available anywhere Verizon network is available--Much of the USA. Cost of phone--$70 to $120 + $35 Activation fee. Minute Cost--700 anytime minutes plus unlimited IN calling (free calling to all Verizon customers) and free Night and Weekend minutes. Availability--Available anywhere Verizon network is available--Much of the USACost of phone--$70 to $130 + $35 Activation fee. Phone Availability--Some nice phones are available and also some inexpensive phones.Network--Verizon network. Click here to go from Best Prepaid Cell to the Compare-Prepaid-Cell-Phones home page from the Best-Prepaid-Cell page. The Net10 and Cricket Unlimited Pay as you go prepaid cell phones get the nod as the Best Prepaid Cell phone plans. Cricket Coverage Maps - Check and see if Cricket is available in your city.